Home » PIllows » What’s the Best Pillow for Stomach Sleepers? What’s the Best Pillow for Stomach Sleepers? Ah, stomach sleepers - the outcasts of the sleeping world. We are mostly kidding, but stomach sleeping is nearly universally regarded as the least healthy sleeping position (although it’s not without one major benefit – more on this below). And, because of that, stomach sleepers are prone to a whole host of health problems (which you probably already know if you’re reading this article). Luckily, choosing the right pillow can help. Below, we’ll show you some of the best pillows for stomach sleepers, including a few options that can help alleviate some of the most annoying problems that usually accompany sleeping on your tummy. Before we launch into a tirade of all the bad things about sleeping on your stomach, we wanted to give you a few of the major benefits of this sleeping position (there are some, believe it or not). So check it out. It’s a good anti-snoring sleep position. In general, though, snoring is the result of (1) an unstable breathing passage and (2) vibrations in your throat. All of these things are exacerbated by sleeping on your back. Sleeping on your stomach can seriously ameliorate many of these causes, especially if your snoring is caused by your tongue falling into the back of your mouth. Sleeping on your stomach also tends to open airways and puts less pressure on your throat overall. Because of this, sleeping on your tummy can also be good for folks who suffer from obstructive sleep apnea. Not to be a party pooper, but even though it’s got one really big benefit (especially if you have a spouse who hates snoring), stomach sleeping has a pretty long list of cons. Here are the most important ones to be aware of. It can throw your spine out of whack. Sleeping on your stomach isn’t great for your spinal health. Here’s why. At best, sleeping on your stomach flattens the natural curve of your spine. At worst, it can actually flex your spine backwards (this usually happens if you have a saggy mattress). Both of these things can cause lower back pain, and if you don’t sleep with the proper pillow and mattress, it can even lead to injury or long-term back problems. It can also put pressure on the nerves around your spine, leading to numbness, tingly sensations, or even pain. It puts quite a bit of strain on your neck. Unless you’re a superhuman stomach sleeper who doesn’t need to breath, you probably don’t sleep with your face pointing directly down in your mattress. Instead, like all stomach sleepers, you probably sleep with your head to one side. Sleeping with your head turned to one side for eight hours or more can really put loads of strain on your neck. In an interview with CNN, New York chiropractor Steven Diamante put it this way: “Think about the soreness you'd feel if you kept your neck turned to one side for 15 minutes during the day.” That’s absolutely trumped by the strain you’re putting on your neck by sleeping that way for eight hours. Okay… I get it. But I can’t sleep any other way BUT on my stomach. What’s the best way to do it? Most people find it very difficult to change the way they sleep. Even if you manage to fall asleep in one position, it can be tough to stay there for the whole night. If that’s true for you, and you’re a stomach sleeper, there are a few things you can do to minimize the problems that go along with sleeping in that position. Tip #1: Get a thin pillow. This is probably the most important piece of advice for any stomach sleeper who can’t seem to make other sleeping positions stick. Having a truly thin pillow can work wonders for the neck, shoulder and back pain tummy sleepers often experience. And the reason it works is pretty simple: when sleeping face-down, taller pillows push your head back further. Thin pillows don’t, so your spine is much more likely to maintain its natural curvature. T﻿﻿here are a lot of op﻿﻿tions, so research wisely. Here’s the trick, though: you don’t want a pillow that’s too thin, or you’ll have the opposite problem (“hanging head” syndrome), which can put different kinds of pressure on your neck. Based on our research, we’ve found that the optimal height for a pillow is 2.75 inches. This tends to work best with medium-firmness pillows. Tip #2: Put a pillow under your hips. This is a pretty simple technique you can probably do today (even if you don’t have a great thin pillow). Put a pillow under your hips to add a bit more natural curvature to your spine. There’s one important note here: if you do this, you’ll probably have to experiment with the size of the pillow and how it affects your back, neck, and shoulders. The idea is to get your spine as close to its natural position as possible. If your hip pillow is too tall, it might curve too much. If it’s too thin, it might curve too little. So just experiment. Try one pillow for a few days, and write down how your back feels. If you’re still experiencing pain, try another pillow of a different height or firmness. Just keep in mind that it takes your body time to adjust to new sleeping positions (in the same way you need time to adjust to a new office chair or a new pair of running shoes), so it might be slightly uncomfortable for a day or so, and it’s best to try each pillow for about a week. 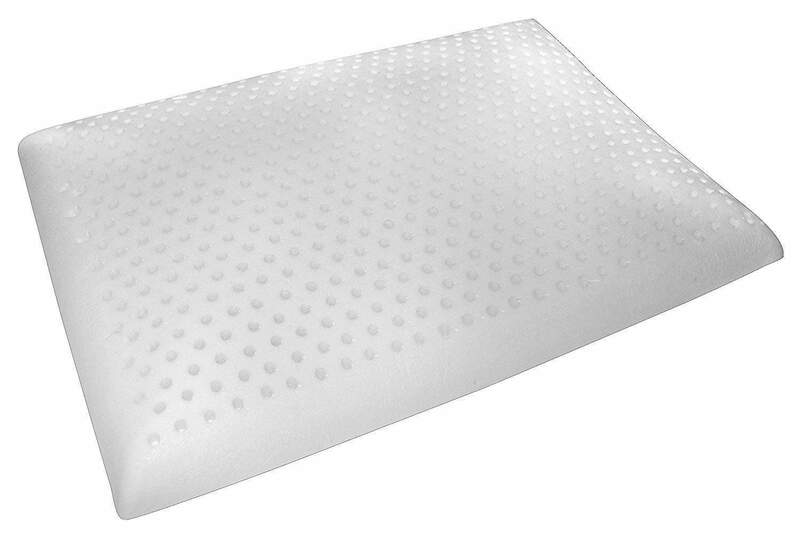 The Slim Sleeper is a great thin pillow that really lands right in that “goldilocks” zone. It’s not too tall, and not too thin. It’s firm, but not rock-hard. The best part is that it’s exactly 2.75 inches, which is exactly the optimal height for most stomach sleepers (big burly guys might need a slightly taller pillow, while thinner folks may need a skinnier pillow). But really, there aren’t many good, high quality pillows that are actually thin enough to be called a thin pillow. This one is. The other great thing about the Slim Sleeper is that it uses dimpled latex technology, which can drastically increase the airflow around your face. And, as most stomach sleepers know, that’s important, since sleeping on your stomach can be hot. 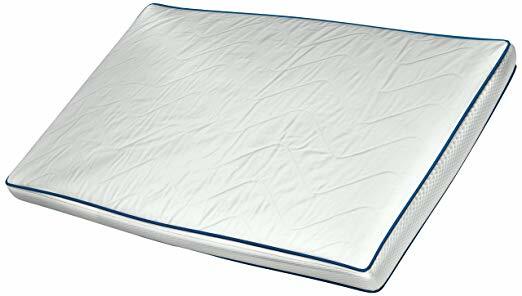 All in all, this is probably one of the best thin pillows on the market, and it’s particularly good for stomach sleepers. Oh, and did we mention it’s all natural? It is, which makes it a good option for all you environmental warriors. Click here to read reviews on the Slim Sleeper. This isn’t quite as good as the Slim Sleeper, but it’s still a decent pillow. The main benefit of this pillow is that it’s not as firm as other thin pillows out there. So, it’s good for (1) thinner people who don’t need quite as much lift when sleeping on their stomachs or (2) people who just enjoy a softer pillow. It’s made with memory foam, which a lot of people enjoy. However, even though it’s ventilated, it’s still going to be very warm (like most memory foam pillows are). It’s made of synthetic fabric that, while not natural, does a pretty good job of keeping the pillow dry (good for sweaty sleepers). It’s also got an interior pocket and built-in protection against dust mites. Is it the absolutely best option out there? No. And it doesn’t top our list. But it’s a good pillow with a few good features. The Hudson Industries Trim Sleeper is a fairly good thin pillow that hits the other side of the spectrum. At 3” high, it’s got a bit more loft than the other pillows here, which makes it a strong choice for stomach sleepers who have thicker chests and need a slightly taller pillow to avoid neck strain. Aside from that, nothing about the pillow is super remarkable. It’s just a good, solid, thin pillow. That said, if you’re going to spend money on a thin pillow, try one of the others first. They’re a bit higher quality (especially the Slim Sleeper), and you may not need a taller pillow anyway. Click here to read more about the trim sleeper from Hudson Industries.